N1 2017 Northeastern Naturalist Notes Vol. 24, No. 1 E.D. Thorne and C. Waggy First Reported Observation of Food Provisioning to Offspring by an Eastern Spotted Skunk, a Small Carnivore Emily D. Thorne1,* and Charles Waggy2 Abstract - While monitoring den activity using remote-sensing cameras in the central Appalachians in West Virginia, we observed an adult female Spilogale putorius L. (Eastern Spotted Skunk) deliver a live Plethodon glutinosus Green (Northern Slimy Salamander) to a juvenile skunk at a den. A possible explanation for the observed behavior could be food provisioning by the adult to provide nutrition and/or an opportunity to develop hunting and prey-handing skills. Food provisioning has rarely been observed in small carnivores such as spotted skunks, but it undoubtedly is a critical aspect of parental care for a range of taxa. Spilogale putorius L. (Eastern Spotted Skunk) was once common throughout the central and southern United States (Gompper and Hackett 2005). In the central and southern Appalachian Mountains, this species has shown close ties to young forest habitats characterized by thick understory of Rhododendron spp. (rhododendron) and Kalmia latifoila L. (Mountain Laurel), emergent rocky outcroppings, and large downed woody debris (Diggins et al. 2015; Reed and Kennedy 2000; C. Stihler, West Virginia DNR, WV, pers. comm.). Parental care is provided by the female until offspring reach adult size (300–700 g) at ~3–4 months of age (Mead 1968). However, little is known about parental care of juvenile Eastern Spotted Skunks because these behaviors are difficult to observe in these types of small, solitary carnivores. On 31 March 2015, we trapped and outfitted an adult female Eastern Spotted Skunk with a 16-g ATS model 1740 radio transmitter (Advanced Telemetry Systems, Isanti, MN) . From March 2015 to May 2016, we radio-tracked this individual 1–3 days per week across Tract Mountain in the western portion of the Ridge and Valley subphysiographic province of the central Appalachians in Pendleton County, WV. Forest habitat in this region consists of mature mixed Quercus spp. (oak) and Pinus rigida Mill. (Pitch Pine) with a dense Mountain Laurel understory throughout. When den sites were physically located, we mounted Reconyx HyperFire HC500 infrared (Reconyx, Holeman, WI) remote-sensing cameras ~3–4 m from the den entrance to record times and frequency of entrance and exit of dens. On 21 August 2015, we recorded a series of 8 photos depicting an adult female Eastern Spotted Skunk delivering a Plethodon glutinosus Green (Northern Slimy Salamander) to her offspring at her den site (Fig. 1). At 01:17:32, the female was seen at the entrance of the den carrying a salamander in her mouth (Fig. 1A). Seven seconds after the female appears, the juvenile was recorded emerging from the den entrance where the female had dropped the salamander (Fig. 1B). At 01:17:42, the adult female was no longer visible and the juvenile was photographed investigating the salamander (Fig.1C). Images from 1:17:53 to1:18:06 show the salamander moving away from the juvenile skunk, then the juvenile pursuing the salamander, eventually capturing it, and returning to the den entrance with the salamander in its mouth at 1:18:14 (Fig. 1D–H). This observation was our first sighting of the juvenile, and we estimated the age of the juvenile to be 2–3 months at the time of recording. 1*Department of Fish and Wildlife Conservation, Virginia Polytechnic Institute and State University, Blacksburg, VA 24061. 2West Virginia Division of Natural Resources (retired), Franklin, WV 26807. *Corresponding author - edthorne@vt.edu. Manuscript Editor: Heather York Notes of the Northeastern Naturalist, Issue 24/1, 2017 2017 Northeastern Naturalist Notes Vol. 24, No. 1 N2 E.D. Thorne and C. Waggy Figure 1. [Caption on following page.] N3 2017 Northeastern Naturalist Notes Vol. 24, No. 1 E.D. Thorne and C. Waggy There are 2 possible explanations for the observed behavior. Food provisioning during the weaning process may provide supplemental nutrition to growing offspring during the period when they learn to forage successfully, and such food transfer may inform offspring of adult dietary preferences while gaining food-handling skills (Brown et al. 2004). While this form of parental care is common among carnivores (Gittleman 1989), it has been rarely observed and greatly understudied in small, cryptic, or secretive species. This observation is significant and unique because it is the first reported observation of food provisioning to offspring by an Eastern Spotted Skunk. Additionally, research on food provisioning in carnivores has focused on social or monogamous species such as Crocuta crocuta Erxleben (Spotted Hyena; Holekamp and Smale 2010) and Vulpes velox Say (Swift Fox; Poessel and Gese 2013), making this a rare observation for small and solitary carnivores in general. 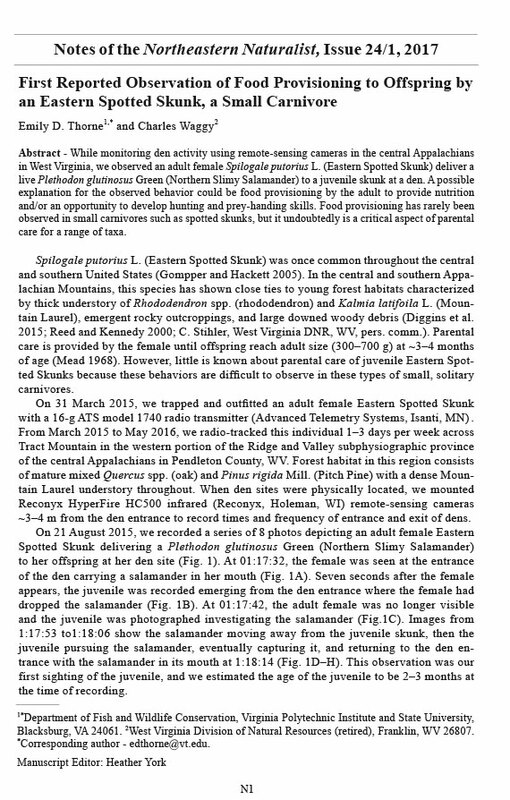 Furthermore, this is the first record of salamanders included in the Eastern Spotted Skunk diet. Although the diet of Spilogale gracilis Merriam (Western Spotted Skunk) consists of insects, salamanders, lizards/lizard eggs, birds/bird eggs, and mice (Jones et al .2008), Eastern Spotted Skunks have been recorded to feed predominantly on insects or rodents and infrequently on birds/bird eggs and vegetation (Crabb 1941). It is unclear whether salamanders are typical prey items or if adult female Eastern Spotted Skunks seek out prey that are larger and slower-moving than their own usual dietary items to feed to offspring, a behavior observed in Otocyon megalotis Desmarest (Kalahari Bat-eared Foxes). Adult foxes provision offspring with lizards, although the adults feed primarily on insects (Nel 1978, Pauw 2016). Nel (1978) reported that to make the effort of bringing food back to the offspring at the den worthwhile, adults switched to hunting larger prey items. Future observations of Eastern Spotted Skunk parental behavior may provide much needed insight into the ecology of this understudied species. Acknowledgments. Funding for this research was provided by Virginia Department of Game and Inland Fisheries Pittman-Robertson Federal Aid in Wildlife Restoration Grant 2013-14307 and the US Geological Survey, Virginia Cooperative Fish and Wildlife Research Unit and M.L. Fies (VDGIF Furbearer Project Leader). W.M. Ford provided helpful comments on an earlier draft of this manuscript. Field assistance was provided by West Virginia Division of Natural Resources and the USDA Forest Service. This research was approved by the Virginia Polytechnic Institute and State University Institutional Animal Care and Use Committee (protocol number 13-119-FIW). Literature Cited Brown, G.R., R.E.A. Almond, and Y. van Bergan. 2004. Begging, stealing, and offering: Food transfer in non-human primates. Advances in the study of Behavior 34:265–295. Crabb, W.D. 1941. Food habits of the Prairie Spotted Skunk in southeastern Iowa. Journal of Mammalogy. 22:349–364. Diggins, C.A., D.S. Jachowski, J. Martin, and W.M. Ford. 2015. Incidental captures of Eastern Spotted Skunks in high-elevation Red Spruce forest in Virginia. Southeastern Naturalist 22:6–10. Figure 1 [preceeding page]. Images captured on 21 August 2015 on Tract Mountain in the western portion of the Ridge and Valley physiographic province in Pendleton County, WV, using a Reconyx HyperFire HC 500 remote-sensing infrared camera. Images depict an incident of food provisioning to juvenile offspring in the following sequence: (A) Adult female (radio collar visible) Spilogale putorius (Eastern Spotted Skunk) delivers a Plethodon glutinosus (Northern Slimy Salamander) to den entrance, (B) juvenile (2–3 months old) Eastern Spotted Skunk emerges from den, (C) juvenile skunk investigates salamander, (D) salamander moves away from juvenile skunk, (E–G) juvenile skunk pursues and captures salamander, and (H) juvenile returns to den carrying salamander in its mouth. 2017 Northeastern Naturalist Notes Vol. 24, No. 1 N4 E.D. Thorne and C. Waggy Gittleman, J.L. 1989. Carnivore group living: Comparative trends. Pp. 183–207, In J.L. Gittleman (Ed.). Carnivore Behavior, Ecology, and Evolution. Cornell University Press. New York, NY. 619 pp. Gompper, M.E., and H.M. Hackett. 2005. The long-term, range-wide decline of a once-common carnivore: The Eastern Spotted Skunk (Spilogale putorius). Animal Conservation 8:195–201. Holekamp, K.E., and L.Smale. 2010. Provisioning and food sharing by lactating Spotted Hyenas, Crocuta crocuta (Mammalis: Hyenidae). Journal of Ethology 86:191–201. Jones, K.L., D.H. Va Vuren, and K.R. Crooks. 2008. Sudden increase in a rare endemic carnivore: Ecology of the Island Spotted Skunk. Journal of Mammalogy 89:75–86. Mead, R.A. 1968. Reproduction in eastern forms of the spotted skunk (genus Spilogale). Journal of Zoology 159:119–136. Nel, J.A.J. 1978. Notes on the food and foraging behavior of the Bat-eared Fox, Otocyon megalotis. Bulletin of the Carnegie Museum of Natural History 6:137–137. Pauw, A. 2016. Parental care in a polygynous group of Bat-eared Foxes, Otocyon megalotis (Carnivora: Canidae). African Zoology 35:139–145. Poessel, S.A., and E.M. Gese. 2013. Den-attendance patterns in Swift Foxes during pup rearing: Varying degrees of parental investment within breeding pairs. Journal of Ethology 31:193–201. Reed, A.W., and M.L. Kennedy. 2000. Conservation status of the Eastern Spotted Skunk, Spilogale putorious, in the Appalachian Mountains of Tennessee. American Midland Naturalist 144:133–138.